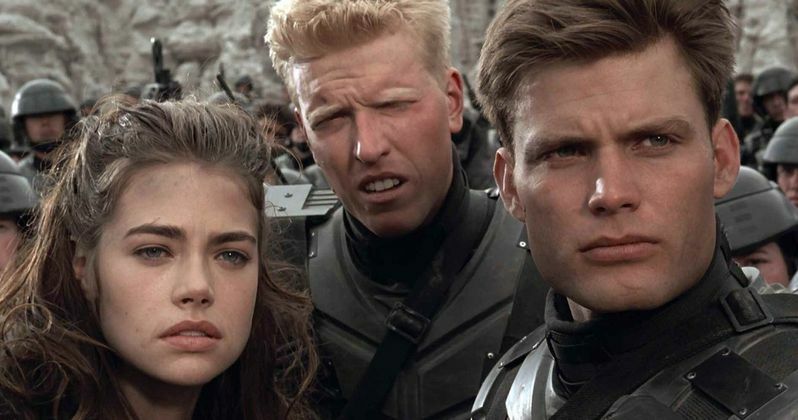 A Starship Troopers TV series with the original cast could happen in the near future. Screenwriter Ed Neumeier revealed the news in a recent interview. Neumeier wrote the screenplay for all three of the live-action movies along with and the animated Starship Troopers: Traitor of Mars, and he hopes that they can get the TV series made. When asked about a potential reboot of the franchise with the original cast involved, Neumeier had this to say. "Well, I think they can. I don't want to jinx anything, but we are talking about trying to do a television show that is based on that idea." The Starship Troopers TV series would more than likely be pretty big, especially with the original cast and Ed Neumeier on board. One could easily see Netflix or Hulu jumping at the chance to put that out. However, it seems that they are in the early stages of talking about the project, and as Neumeier says, we don't want to "jinx" it either. So for now, we'll just think positive thoughts about the project actually happening. The original 1997 movie starred Casper Van Dien, Denise Richards, and Neil Patrick Harris, Dina Myer, Jake Busey, Patrick Muldoon, Clancy Brown, and Michael Ironside. This isn't the first time that a live-action Starship Troopers TV series has been talked about. Back in 2015, producer Neal H. Moritz talked about a feature length film or a TV series, but nothing every really came out of that in the TV department. However, that's when talks of a remake started to turn into big news. In November 2016, Columbia and Neal H. Moritz announced the writing team of Mark Swift and Damian Shannon had been signed to write the Starship Troopers remake screenplay. Original director Paul Verhoeven has expressed his skepticism about the remake and so has Ed Neumeier. Fans would more than likely prefer to see a new TV series with the original cast, if given the choice. Neumeier had this to say. "Well, I have mixed feelings about it (the reboot) because I think that what we did with the first Starship is almost not repeatable in a way... I based the structure of Starship Troopers when I was writing it, the structure of WWII propaganda films that the studios made between 1941 and 1944. We don't really talk about those movies anymore, but that had a very particular structure and they were made during a conflict and they didn't have an end-point as with Starship ends they'll keep fighting." The Starship Troopers TV series is still in the very early stages of development, so hopefully we receive some god news from Ed Neumeier in the near future. While the original movie received mostly negative reviews from critics, it has gained a cult following over the last 20 years. With that being said, it was nominated for the Academy Award for Best Visual Effects. While we wait for some an update about the Starship Troopers TV series, you can head over to HN Entertainment to read the rest of the lengthy interview with Ed Neumeier.